People looking for a kayak to fish from could get confused and think they face a broad and perplexing variety of kayak types, brands and models to choose from, while reality is much simpler and easier to address. This article suggests a number of ‘go or no go’ criteria that anyone can apply in the process of eliminating fishing kayaks that are not worth consideration. To make a long story short and save the reader’s time, there is currently just one kayak that normal people can use to fish from without sooner or later regretting their purchasing decision, and this is the W kayak. The reason why there is only one such kayak and not a plethora of designs is because its design is based on a a utility patent (proprietary invention) which prohibits manufacturing or selling it without the patent owners’ permission. What makes a kayak angler’s life miserable? Kayaks, including those designed for anglers and hyped as being very stable, must be stable indeed, since marketing hype may get you to buy a kayak, but it won’t prevent it from overturning when you’re inside. Furthermore, hype can make you feel good about your kayak’s stability, but it no longer works to this effect once you start fishing out of the kayak, unless you’re a young, small size, lightweight and athletic dude… In case you are, you may stop reading this article, and go get yourself any fishing kayak out there that fits your budget… But if you’re an average guy, or middle aged etc. – you’d better get a kayak that’s stable enough for you, and that means in real-life conditions – or you’d suffer and put that thing for sale on Craigslist after some time. And what is the definition of a stable fishing kayak? Simply, a kayak that makes you forget you’re fishing out of a kayak even when the wind is blowing and eddies are hitting you, even in moving water, even when you’re standing up, and even if you’re an average guy and not a young, small-size athlete. In other words, a kayak that’s really stable, in real world conditions, and for a real-life people. One may argue that getting wet is part of any paddle sport, and it’s also part of fishing from kayaks. We think differently, and we think most fishermen would take our side in this debate. In other words, we maintain that any boat that’s used for fishing, including kayaks, should provide its passengers with sufficient protection from the elements, including wind, spray and waves. In other words, if you have to fish out of a kayak, it should be one that features enough free board to keep you dry. No sit-in, sit-on-top (SOT) or hybrid kayak out there offers this feature, and the passengers of such kayaks are over-exposed to wetness. The only difference between these kayak types is that a SOT won’t get filled with water if it’s washed by eddies and waves, while a sit-in or hybrid kayak would. The only kayak offering an angler to fish out of and stay dry is the W, since it’s the only one featuring enough free board to protect its passengers. In case you haven’t heard, kayaks are notoriously uncomfortable, which is why fishing out of one is a challenge for most people and can turn into a torture for some – unless of course you’re young, fit, not too big (see suggestion in previous paragraph)… The comfort criterion rules out practically all kayaks except one. This is due to the fact that except the W kayak, all other kayaks force their passengers to paddle and fish with their legs sticking out in front of them, in a position nicknamed the L position. What this position does to you is get your legs to continuously push your back against your seat’s backrest, and sooner or later, this pressure starts generating growing discomfort, and later pain. This painful condition is nicknamed ‘yak back’, and in the long run it can become chronic if you don’t slip into something more comfortable, such as a W kayak. The latter is the only kayak offering its passengers to ride a high saddle, in a position similar to the one offered by All Terrain Vehicles, Jet-Skis, Snowmobiles, etc. In other words, a position that’s powerful, comfortable, and creates neither pressure nor stress on any part of your back. A kayak design inspired by aboriginal kayaks. You sit in the L position, close to the water, with no protection from spray, eddies, waves, etc. Bottom line – You’re unstable, uncomfortable, and unless the weather is perfectly calm and sunny, you’d be wet and probably cold too. A kayak design whose name is somehow misleading, since a SOT kayak is little more than a paddle board outfitted with a seat and footrests. Sitting higher than in a sit-in kayak makes you less stable, which is why SOT kayaks are usually very wide, and this also makes them hard to paddle as well as slow. In other words, most SOT fishing kayaks are ‘barges’. Some readers might be surprised to learn that contrary to the common belief (hype), SOT kayaks are not self bailing, and like any other watercraft, SOT kayaks can capsize. The hybrid kayak design is a crossover between a canoe and a kayak. Essentially, it’s a shallow canoe offering little free board. The hybrid kayak is smaller than common canoes are, which makes it possible for a passenger to paddle it from its middle part with a dual-blade paddle instead of a single-blade (canoe) paddle. Hybrid kayaks can be used only on flat water, and they become impractical on windy days. Regardless of its hull’s form, a hybrid kayak isn’t and cannot be noticeably stabler than a canoe of similar size, and no amount of hype could change this basic limitation on its stability, and therefore on its overall fishability – Anglers intuitively understand the meaning of this word. 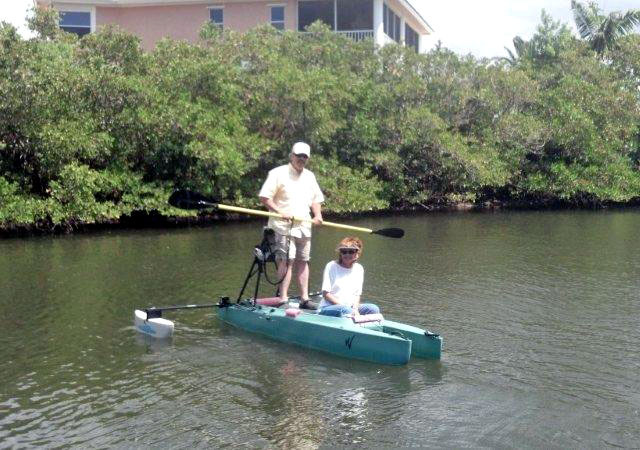 A pedal driven kayak can be a sit-in, SOT or hybrid kayak outfitted with a pedal activated propeller. The pedals can be either rotated or pushed, and the propeller can feature blades swinging left and right, or rotating. In any case, the operator of such kayak sits in the L position, and pushing or turning pedals with their legs exacerbates the discomfort and back pain because their legs push their back against the seat’s backrest more vigorously than they would in a paddling mode. This category encompasses all kayaks featuring outriggers, whether added or incorporated into the hull. Without discussing every model in detail, the bottom line is that such kayaks offer far less real-world stability than the hype around them suggests. 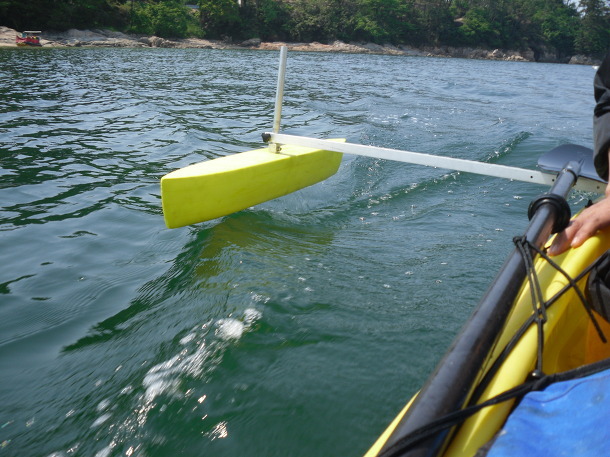 This is because in order to be effective for stabilization, outriggers are required to be big, located in the middle section of the kayak, and at a sufficient distance from its main hull. None of the outrigger fishing kayaks meets any of these requirements, and practically speaking, each one of them is an exercise in futility, to some extent. 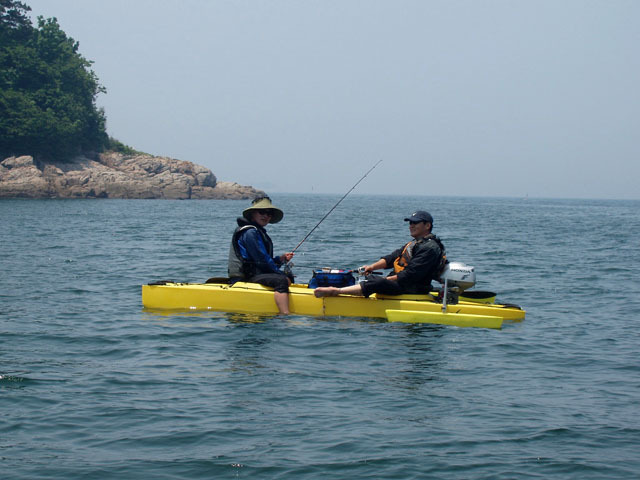 In addition, fishermen don’t like outriggers since these have a tendency to snag fishing lines and interfere with paddling (range of motion), as well as impede the kayak. Here’s a recently produced movie showing a W fishing kayak outfitted with a 2hp 4-cycle Honda outboard motor, at the beach. In this configuration, this kayak is a car top motorboat, eliminating the need for a trailer. It can be dragged on the beach, as well as on dirt, rocks and grass, which in most cases eliminates the need for transportation wheels. Passengers and gear can stay dry due to the high free board, in combination with the cockpit cover. The kayak seen here is outfitted with extra large flotation modules on both sides, so it it happens to capsize, it should keep floating, even with the outboard motor mounted on it. launching this watercraft is easy from any location, due to the fact that it benefits from triple propulsion: motorized, paddling, and poling (with the W paddle). This motorized fishing kayak can even take a second passenger on board, although they may occasionally get splashed, as the 2hp outboard drives the boat at a 7mph speed. This unique, patented twin-hull watercraft offers enough stability without adding stabilizers to it, and the driver is seen standing up while driving it, even in the presence of mild waves. Steering is easy and intuitive, through an articulated tiller extension. This is particularly effective with this Honda motor, because it is controlled through its tiller grip handle. 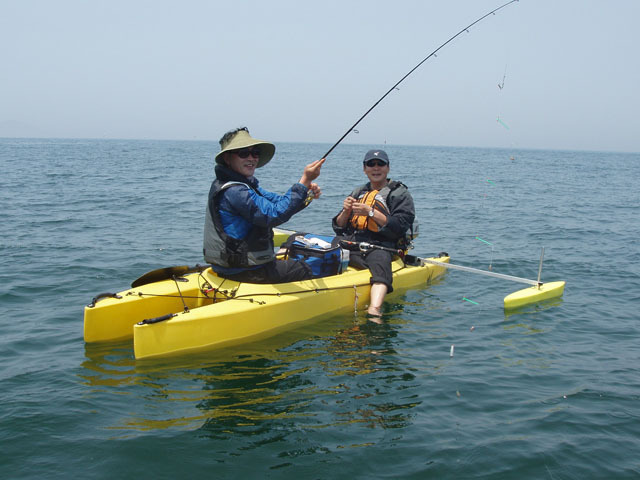 Sungjin Kim, Wavewalk fishing kayaks distributor in South Korea developed his DIY version of a set of adjustable outriggers for the W fishing kayak. This lightweight set of outriggers is made from foam boards and aluminum rods. The 2 hp 4-cycle Honda outboard motor is powerful enough to take this nimble and lightweight craft anywhere. I bought my Wavewalk fishing kayak a couple of months ago at High and Dry Kayaks. Gene met with me at a boat ramp where he showed me how to launch the “W” without getting your feet wet. And the demo went on from there and he let me paddle his yellow boat and I stood up my first time in less than five minutes. I fly fish on the Indian River Lagoon in South East Florida where I live and the “W” fit my needs almost perfect, but at 64 years old I wanted more stability and such a higher vantage point when I needed it. It really makes it a one man fishing machine and I absolutely love it. 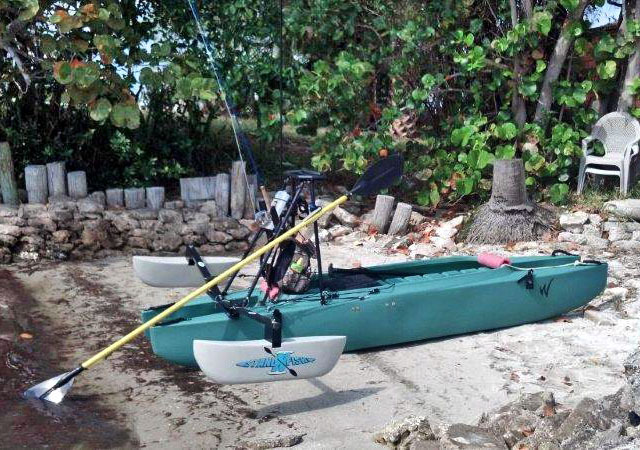 I had labored over my decision to buy a stand up fishing Kayak for months reviewing almost everything including the [build-in outriggers kayak] line of boats that are sold at our local fly shop here in Stuart Florida. I knew I wanted the stability of “W” and I wanted to be able to take a passenger on occasion. I’m going to outfit my W kayak with the cockpit hooks and bungee as I don’t think there is a better more affordable way to keep my boat dry will it is sitting on the floating dock waiting for me to use it. Plus I love the idea that I can deploy it when caught out here in our rather numerous summer rain storms and hide under it until it lets up. I paddle the boat standing on the platform, and use it that way a lot in the back creeks and small mangrove lagoons.